Bespoke double glass doors with arched glass panels and fixed side-lights set into arched openings for two external doors and an internal glass entrance screen with double glass doors. 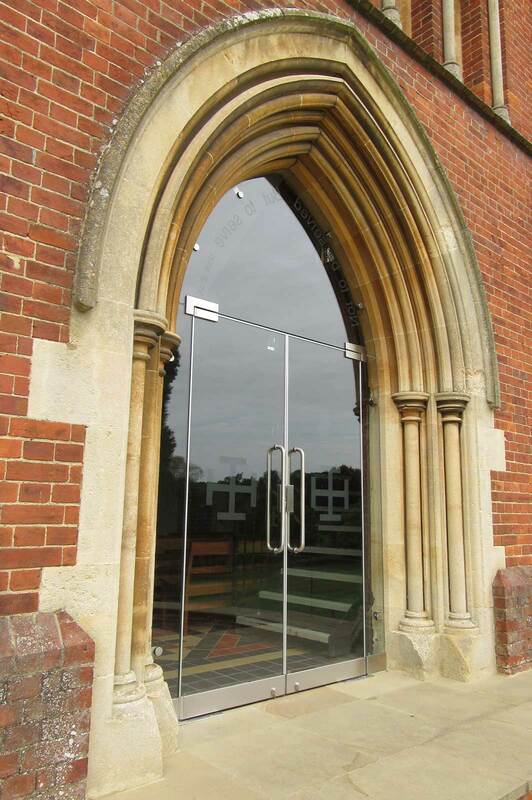 Ion Glass were commissioned to supply three sets of bespoke double glass doors to Cranleigh School, using arched glass transom panels and glass sidelights for a secure and contemporary result within the original door openings. 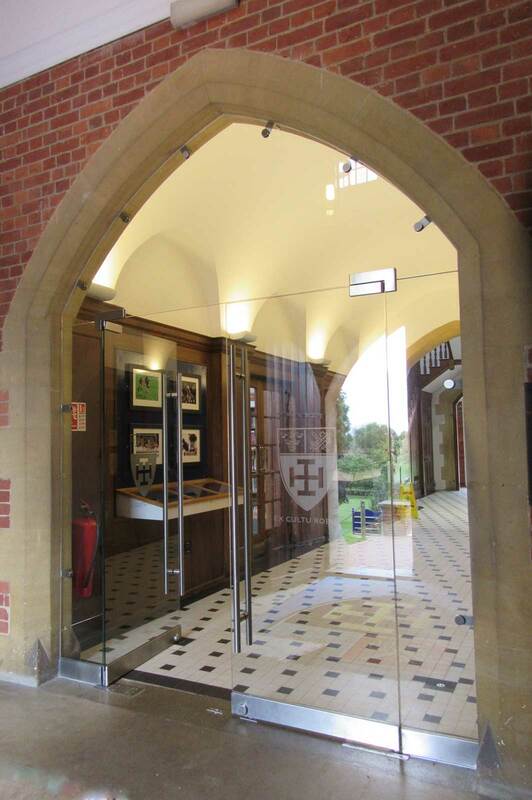 An internal glass entrance screen with double glass doors opening into the school reception area improves the light levels within the hall, allowing the original, external wooden doors to remain open without heat loss. The introduction of the new glass inner doors creates a stylish and contemporary entrance, welcoming visitors to the school. The bespoke external glass doors to the Chapel sit immediately behind the war memorial, providing an unhindered view of the memorial from the chapel. From the outside, the statue itself is artfully reflected in the glass of the doors. The third set of external bespoke double glass doors opens out into the main quad, providing a light and airy entrance with a view to the quad, replacing the original, more austere wooden doors. 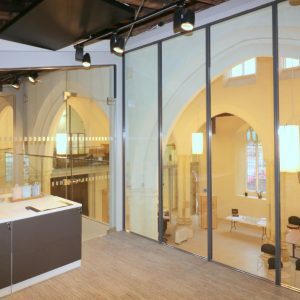 Fully secure, manually operated, armour plate glass doors with arched glass panels above and fixed glass sidelights were installed in the external arched door openings. 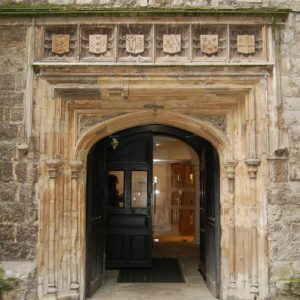 Spring plate brackets were sourced to fix the sidelights and arched over panels to the existing external timber door frame of main quad door and to the stone arch of the chapel door. An internal glass screen was installed to create a front entrance lobby inside the existing timber doors. 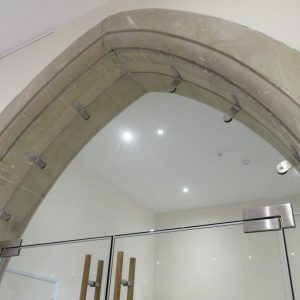 Fitting flawlessly into the original arch of the hallway, the screen comprises of similar arched glass panels above, glass sidelights and a pair of double glass entrance doors. Each glass door was fitted with hydraulic floor springs with an adjustable closing speed and a hold open facility. The external doors were made fully secure with locking pivot rails and centre locks for maximum security. The door screens were precision measured to fit accurately into each non-standard space to ensure the optimum result, taking into account the ‘out of true’ nature of all the openings. Typically with older, heritage buildings the arched doors are slightly ‘out of true’, meaning each door, whilst ostensibly similar to the others, is a unique installation. 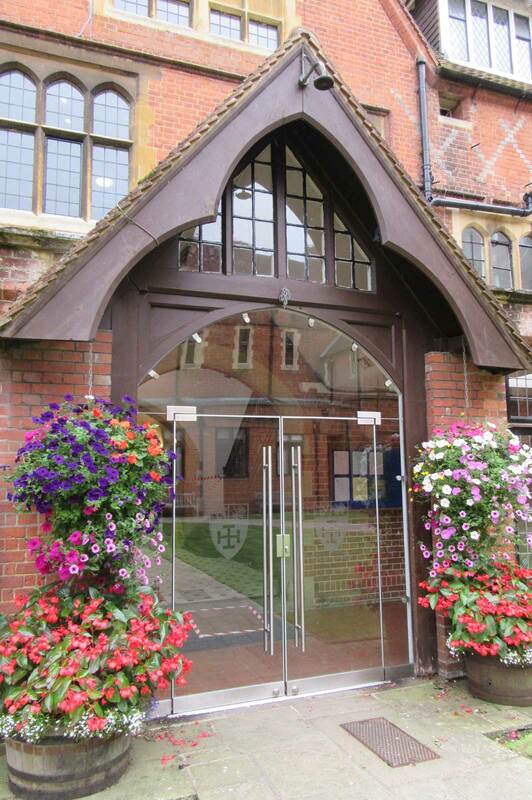 The result created for Cranleigh School modernises the original entrances, improving the light levels within the building without detracting from the atmosphere of the building. The internal door also adds an additional level of security, minimising draughts and heat loss whilst providing a more welcoming approach for visitors. 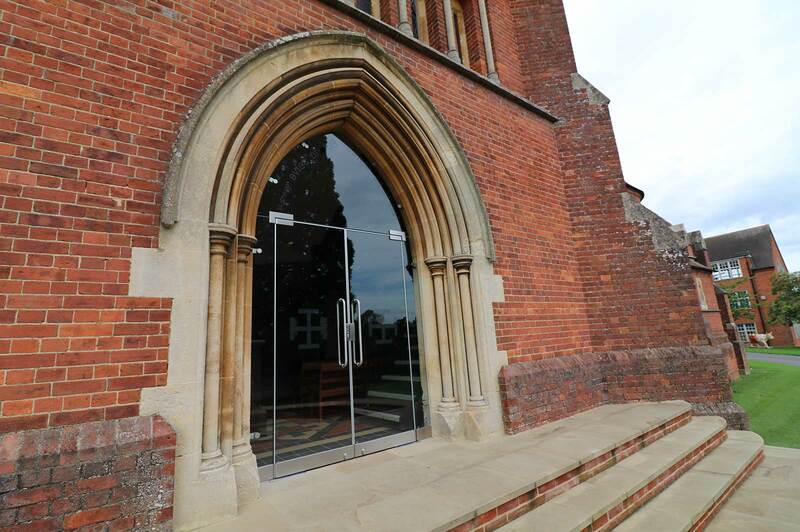 Following the successful installation of the doors, Ion Glass were subsequently commissioned to install the curved glass balustrade surrounding the Nicholas Dimbleby war memorial at Cranleigh School.